In 1877, the first low-level bridge was constructed to provide a more reliable means of crossing the river. By this time, a number of temporary government buildings, including the first schoolhouse on the north bank of the river and a police residence and lockup, had been erected in the reserve. The bridge, which directed all traffic through the area, was opened on 13 August 1877. Opened with great fanfare by the Governor, Sir Arthur Edward Kennedy, in the presence of two or three hundred guests, the bridge became known as ‘Sir Arthur’s Bridge’. 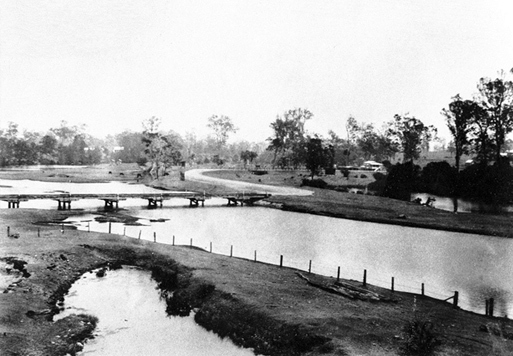 North Pine River Reserve and the old low-level road bridge over the North Pine River, late 1920s. The original bridge, which was severely damaged by the 1893 flood, was rebuilt in 1896. Remains of the timber and concrete piles, that were once part of the second low-level bridge, can be seen during periods of extreme low tides. 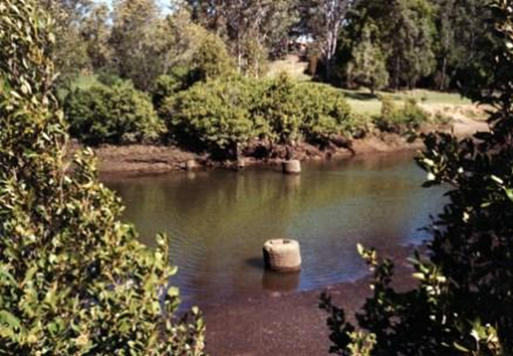 Remnants of piles, North Pine River, 2002.